UPDATED: April 3, 2014 – What it looks like now. My Recovery: After my procedure the site was very numb for several months. The swelling and redness went down within a few weeks, but it was quite pink for about two months. My friend Shaugna gave me some Kelo-cote and I highly recommend that or a similar silicone treatment for the texture and color of the scar. The pain was only bad in the first days as the topical wore off, but it was mostly just numb for along time. I’m almost a year out and it’s still a bit numb in spots. Complications: One of my external stitches didn’t come out with the rest, but luckily I saw it in the rearview mirror before I left the doctor’s office and went back in. They had some trouble getting a grip on it because it was there wasn’t much above the skin and that wasn’t comfortable. The very center of my scar is a little wide and that’s because it’s where the biggest (both widest and deepest) part of the carcinoma was. It was strained as it healed and wasn’t closing as well as the top and bottom of the incision. It was actually a bit puckered and I saw my doctor about it because I was afraid it was coming apart. It wasn’t tearing, it just had more missing skin to heal over, and I wore a pressure bandage for awhile and had to put pressure on it with my fingers inside and outside of my mouth. Then in August, three months after my procedure,I had an internal stitch that wasn’t absorbed work its way up to the surface. It looked like a hollywood zit, it was so big and with such an obvious head that it almost looked fake, but when it finally broke through the scar site finished healing. In the end: I frequently meet women who have my scar. I don’t say anything to them, and if I hadn’t had it myself I wouldn’t even notice theirs. I don’t say anything, but I recognize it instantly because I have spent so much time looking at mine (not in a negative way, just treating it and putting the kelo-cote on) that I can tell exactly what it is. I’m really good about wearing sunblock all of the time and am more aggressive about it with my kids and my husband (we’re all this fair).I also had my skin check in early January and I’ll be going in if I get suspicious. The only advice I would have for those thinking about or about to have Mohs is to make sure you have a good doctor. Mine was great, but my original dermatologist should have sent me to him two years before she did. If you have something that bleeds with no reason, go immediately to have it checked out, and if your doctor even mentions that something looks suspicious, it’s better to biopsy it early. Even if it’s just a basal cell carcinoma, the sooner you get it removed, the smaller the injury and subsequent scar. So . . . here’s the picture. I don’t think it looks bad at all, especially if you compare it to the post-op pictures, and this is with no makeup on the scar so you could see it. It’s a little pinker than normal from me cleaning my makeup off before I took the picture. Thanks for following my journey and I wish all you Mohs folks health and happiness and a smooth recovery. Happy sunscreening! UPDATED, May 2013 – stitches pictures waaay down at the bottom. I wrote this post this because when I learned I needed Mohs surgery, everything I found online was genuinely helpful but very clinical – good example here. I imagine other people who require Mohs surgery for their carcinomas might like to know what it’s like from inside the chair. So here is a recap in case you find yourself nervously waiting a slice and dice of your own (it’s really not as bad as it sounds or looks). In the parking lot Jim took a picture lot of my little skin cancer. It doesn’t look that big because it wasn’t large to begin with and then my original (non-surgeon) dermatologist sliced the top of it off for biopsy about a month ago. So here it is roughly 2/3 of the original size. It’s very white (and so am I) so it’s kind of hard to see. I cropped so you can see it better – two white spots slightly left of center in the photo below. The lower white spot has a darker spot in the center surrounded by a white ring. I went in to the office (with my ever-lovin’-hubband Jim – man, am I blessed to have him) and paid my copay. The nurse brought me back to sign the consent form. I felt silly and a little vulnerable because my feet didn’t reach the floor. The surgical chair is like a dental chair, so the nurse leaned me way back and gave me the Betadine treatment. Since Liam (my son whose had 12 heart surgeries) has been doused in the surgical scrub (when he was two I had to bathe him with it before a surgery and I had it pre-op for my c-section for my daughter Moira) that was familiar and no biggie. When the surgical lamp came on, they very kindly draped my face with a paper square that had a hole cut out in the center for the surgeon, but it blocked the light for me and was kind of like hiding under the blankets. Cozy and reassuringly hidden, out came the needle. Honestly the first round of needling was possibly the worst part, especially if you have a good surgeon because he/she will make sure to poke every nerve before the cutting starts. Lots and lots of deep and meaningful pokes later and my lip was numb as can be. After that my doctor performed a little artistry with a pen to make cut lines on my now “enhanced” swollen lip. Nicely numbed, there was some slicing and lifting (felt like gentle tugging), then lots of snipping as the cells were removed for the pathologist. To control the bleeding the surgeon cauterized my wound a few times. I experienced cauterization with a previous finger surgery, so I was neither surprised nor delighted with the smell of my own burning flesh. As it was directly beneath my left nostril it was more powerful than when I had minor hand surgery. The whole procedure didn’t take terribly long, maybe twenty minutes. I then waited forty-five minutes (they had HGTV in the waiting room so it wasn’t that bad) for my results. This is what I looked like while I waited. The pathology report came back and I had three dots of cancer left in the wound area, so I went back and my face was draped again. I had more shots (which hurt less than the first shots, most of them I didn’t even feel at all). The doctor used the map to slice around the carcinoma area then clipped it out with scissors. I will tell you, it’s kind of weird to hear someone cutting skin off your face with scissors. Then more cauterizing, bandaging, and waiting for the next pathology report. The second round provided fewer cells to assess than the first, so it took less time. This is me after the second surgical dig into my face. After the second go-round but pre-stitches. When the second pathology report came back clean, I just had to wait for another patient to finish his procedure, and I went back a third time for stitches. This took the longest because there was new numbing in new places so it hurt a little, more cauterization (and I felt one of them and it felt like a little electric zap), then even more numbing because I was not supposed to feel that. When the bleeding was controlled, the surgeon made the internal wound stitching. After that he began snipping the healthy flesh to make it loose so it could be stretched over the missing flesh, and finally the top stitches. That part took the longest because he went all the way around the wound to make the flaps and then sewed it up. As someone who spent significant free-time between age 11 and 29 cross stitching, hearing the thread drag through one’s own skin on the face and feeling the familiar tension of the art of sewing beneath one’s nose is somewhat disconcerting. However, it went well, and I was bandaged by the nurse who was incredibly kind to me in my nervousness. I have a lot of local anesthetic swelling now though – see picture below. That third bandage comes off tomorrow, and I have to 1) keep the wound and stitches moist with Vaseline, 2) try not to talk too much (oh my God this is the hardest part) and 3) eat soft foods so it heals with minimal scaring. If you have this on your forehead or nose, the talking/eating part need not apply, but because it’s on my lip/mouth area I have to be cautious. Stitches come out next Monday, and I’ll update with a stitches picture later. In the realm of pain, I think this is no worse than having totally worse a dental filling (so far – ask me again tomorrow), but it’s extremely visible to people around you. So, that’s a bit awkward. However, had I not set up an appointment to see the dermatologist when it started bleeding in March, it would have just kept growing and growing and growing. Considering the complexity the surgeon faced making the least of the scar, if the carcinoma was much bigger, the wound left would definitely be worse. Even though I rarely played outside as a child, never smoked, always wear sunscreen and am under 40, I had a carcinoma. It’s not a terrible cancer because it almost never spreads through the body, but if you don’t take care of it you can lose whole parts of your body (chunks of ear, nose, lip, etc). Better to have it off before it gets big and even better not to get it at all. I’d preach about the sunscreen, but I’m extraordinarily SPF compliant, and it still happened to me. It just happens; the important part is being a grown up and getting it treated. Now, the anesthetic is wearing off, and the construction crew that was re-paving my street has moved on. So I’m going to take a nap because I was a bit nervous last night and did not sleep well. Plus, after surgery crash naps are the best. If you’re getting your face Mohs’d, or another body part done – good luck! Don’t be afraid, get a good and qualified surgeon, and congratulations for taking care of yourself! Updated with stitchery pics – I warned you twice. I had to go to Target for some prescriptions and I now know what it must feel like to be obviously disfigured . . . people kept looking away. Makes me wonder what they thought. “Dog bite?” “Car accident?” “Bar fight?” or “Domestic violence?” I bet few if any suspected carcinoma. Ah well, it will heal all in good time. Until then, I’m staying in for a week when I get the stitches out. This is a “little” skin cancer. Closer, but it’s so red/swollen you can’t see all the stitches. Im proud of you and i’m glad you are better. I too am scheduled for the Mohs surgery on upper lip line area in 2days. Very nervous and scared to say the least. Feel almost guilty for the vain part of the nervousness of OMG what will I look like post surgery let alone the pain factor. I have to remember what a positive step I’ve taken in my health. Your story and untouched pics have helped me tremendously on what to expect. So Thank You and I hope all is well. Thanx so much for sharing. How does your lip look now? Could you post a pic? Just had Mohs right above lip and into top of lip. Very swollen and distorted. Scared of what it will look like in future. You are an inspiration. Hi! It took a few weeks for it to flatten out and be more pink than red. In August an internal stitch that didn’t absorb worked its way out. Since then it has healed very nicely. I think it would have healed much faster if that knot had absorbed as planned. My husband will take a pic in the morning (in sunlight) and I’ll post it. Hope you feel a lot better soon. I mostly stayed in until the stitches came out. I had the identical procedure on the right side of my lip on the 15th of January. My procedure went exactly as you described, with the exception of a second round to get all the margins. What I wasn’t prepared for was all the swelling. I’m now on post op day two and my upper lip is over lapping my lower lip. I’m following all the post op instructions and have virtually no pain and there are no signs of infection, but the swelling really bugs me. I’d be interested to know how long it took for your swelling to completely resolve. Hi, Bob. Yes the swelling went down in about a week it was no longer swollen at all, it just receded day by day. I finally got some snaps of my scar now and will post a new blog post for you and all the other basal cell/Mohs folks who have been asking either tonight or tomorrow. Thanks! PS – good luck with your recovery! Thanks Amanda. My swelling is down significantly. I’m 1 week post op and I’m anxious to get my sutures removed. When did yours come out? Hi, Bob! Thanks for being a better responder to my own blog for Katie than I was! I hope your scar is all healed up now and you’re not having any new issues! Congrats on the wedding. I’m sure it will be beautiful and so will you! I’m getting ready for surgery on Thursday and my spot is in almost the same place as Amanda. Thank so much for sharing this journey! I am wondering how long before the site is office-appropriate and hoping it is wedding-appropriate before my son’s wedding on June 29th! Hi, I hope your surgery went well! I updated with a photo 11 months out. http://wp.me/p1si9K-T8 I would say by June with a little concealor and powder no one will see it at all. When I wore makeup even two months out it was almost invisible and when people ask me about the surgery I had I have to point out the scar. The only time after the first two weeks that it was bad was when the internal stitch worked its way up, but if your incision is pretty straight (the carcinoma wasn’t too deep or wide) then your stitches will hopefully absorb easily. I just had a big hole in the middle of mine because it should have gone much sooner than it did. Katie, use plenty of ice packs to the wound for the first 48 hours and keep it moist with vasilene. Don’t be surprised at the amount of swelling. It will resolve and you will be good to go for the office by May 15th at 7:00 am. 🙂 I’ll bet you’ll be just perfect for the wedding. Bob, please tell me May 15th at 7 is a typo – that’s almost 2 months after my surgery! I do appreciate the support for perfection at my son’s wedding. Thank you for checking in with me on this! Sorry Katie…make that April 15th. Actually, I am just guestimating. Different individuals probably heal at different rates. Whatever you do, if you are a smoker…don’t smoke! Smoking retards the healing process. I’m sure you’ll do well. Good luck! Thank you Amanda for the information. I have just had the procedure in the exactly the same location above my lip. It has turned out well so far and I truly appreciate the fact that you shared your experience. Thank you for sharing! I’m having the surgery tomorrow and your blog is the only thing that put my fears at ease! I have the moderate version of skin cancer and left it untreated for 2 years because I thought it was just a blemish from pregnancy! Hopefully it did not spread but I am trying to stay positive. Thanks again! Hi Liz! I hope you are recovering well. Remember ICE and keep your head elevated. Rob, I’m sorry you had a bad experience. My bet is that your case is an exception to the usual experience. Katie? How about an update…. I can happily report that I feel cured and my scar is barely visible. The lip feel back to normal and my wife even kisses me! When I had lasik they gave me a Valium. I don’t see why this doctor couldn’t provide you a mild sedative to help you relax since you’ll just get local anesthesia. I managed alright, but my son’s had 12 heart surgeries, so I now have nerves of surgical steel (just kidding), but seriously it’s not uncommon to give patients something to calm their nerves for a procedure like that and if it’s really troubling you, it’s appropriate to inquire. Good luck! Thank you so much for posting this! Have a Moh’s scheduled for next week for a basal cell – right at the lip line. I think that your incision site looks great, and it makes me feel a little more comfortable about what’s getting ready to happen. I was wondering about the whole dermatologist or plastic surgeon as well.. Wondering who Dana, in the post above , is looking at using…I’m in the Atlanta area as well and have been researching like a crazy woman! Thank you again for sharing your experience. So glad to hear back from you! It’s good to be able to talk with people that are going through the same thing! I use Dr. Linda Benedict, and have been using her for years, as my regular dermatologist. Who is your doctor? I actually went to Dr. Nalovic for a squamous cell on my forehead last year – and she did a good job, but it was in a fairly easy spot to work with. I did see her last week( doing the same as you – consulting and deciding who I like the best and think will do the best job) and she told me it wasn’t going to be pretty for a while! So she’s very realistic, and I know a good surgeon, but with my lips I’m taking my time and looking at all options! ( a little type a here too, and apparently a little more vain than I realized!!) I am also consulting with two others: a Dr. Baucom, who is supposed to be really really good and has been recommended by another dermatologist, and some nurses that work at Dr. Benedict’s. Also consulting with a Dr. Pharris, also recommended by a couple of dermatologists as. I have made an appointment with Dr. Robinson too – but he’s a little further out schedule-wise than I would like to wait. I have two consults this Thursday and am going to try to make a decision then. I actually already have the procedure scheduled for Dr. Nalovic on May 29th, just in case, so if I choose her maybe we will run into each other! I’ve also struggled with the plastic surgeon vs Moh’s surgeon and there are so many different opinions. My daughter dates a doctor, and he feels that the Moh’s surgeons are very qualified, that they specialize in reconstruction and do these procedures day in and day out while the plastics don’t do the closures as much as they do. I’ve called several plastic surgeons and it seems as if there are only a few here and there that do the Moh’s closures. Anyway, I’m rambling on….I wish you good luck with everything too! Let me know if you find a wonderful doctor I haven’t found yet! and I’ll let you know about Baucom and Pharis after Thursday…. Hello! Yes, it is good to have someone to talk with (in the same city) and going through the process. I have to admit, it has been a bit overwhelming. I have been going to Dr. Sylvia Wright (since we moved here 3 years ago). I’ve had a couple of BCC’s removed on the chest in Los Angeles, but that was about 4 years ago and the removal was minimal (cutterage). So this one on the lip is a bit more daunting (and as you said hits the vanity chord a little more than I would like to admit!). I would love to hear your thoughts of Baucom and Pharis after you’ve had your consults – it’s interesting that they both did their Moh’s fellowships with the same doctor in Pittsburgh. Please feel free to email me directly if you like. I”m at danamichelelambert@gmail.com. And yes, I may just bump into you at Dr. Nalovic’s office on the 29th! Good morning! It is a bit overwhelming! I’ve been driving myself and my family crazy! They will be glad when I get this done!! Amanda, just looking at your photos again – and you had a flap done when they stitched it up, right? They didn’t go through the lip line, but rather the stitches on top of the lip when they closed it? I’m hearing two different thoughts on closing, one is the flap, and the other straight through the lip. Have been researching and consulting like crazy and still can’t make a decision. Your spot looks fantastic though! Thanks again for posting this! Thanks! Yes, it looks very good! Like I said, going back and forth between a flap and going straight through the lip. The more I look at yours, the more I think it would keep the natural line of the lip without the possibility of having it mismatched if they went through it. Your blog has been amazing – Dana and I met through here, and have been emailing back and forth as we consult and talk with the different doctors and options here in Atlanta. It’s been a huge help and source of support! Thank you! Thank you ! I thank everyone for the postings. I just was diagnosed and am researching my options. My lesion crosses the vermilion of my lip straight up towards my nose. I am appreciative of the pictures presented and all the information as this helps me to understand what I will be facing. I am just concerned about scarring, reconstruction and healing times due to a hectic schedule that I lead. This blog will be my best friend for the next year. Hi, Mohs friends. I don’t know if you’ve looked around in the rest of my blog, but I wrote a book. It’s on sale right now on Kindle for $1.99 – amzn.to/1nisM7E if you would like to read it and support my writing. Bought your book Amanda, looking forward to reading it! Kim, just take your time and research all the doctors in your area, and being on your lip, you may want to consider a plastic surgeon. Ones that do MOH’s closures and take insurance can be hard to find though. It’s a process! I’ve consulted with about 4 doctors, and didn’t feel comfortable with all of them – still am trying to make that final decision. Good luck! I’m so thankful to have found this blog Amanda. I have a Squamish cell in the exact place as your was, and I live in Atlanta . My biopsy spot looks just like yours did and I’ve been worried about the end result cosmetically . Marcie and Dana if you have any input on doctors in the area I’d also like to hear about your experiences . I’ve been referred to Dr. Amy Kim but have not met with her yet. This is all new to me , I just got the news yesterday . Hi Dana! Thanks for the reply, it really does help to discuss different options. I did hear from Marcie today. I believe before I make a final decision I’ll consult with the surgeon she used and also the Plastic Surgeon along with the ones recommended by my dermatologist . Im in a time crunch because of the type and also leaving on vacation the 17th of next month. Thanks again Amanda for starting this blog!! Dana: I too have a 8mm lesion that is at the cupid’s bow and crosses the vermillion. I had been referred to a Moh’s surgeon but due to what I learned, I have elected to have a facial plastic surgeon. I am scheduled for my surgery in two weeks and a bit apprehensive. I would love to hear more about your surgery and post op results. Hi Kim, nice to meet you. I’m happy to discuss my Mohs surgery and closure procedure in more detail with you. I don’t want to usurp Amanda’s blog with my own experience (! ), but if you would like to email me directly I can give you more information on my BCC and Mohs experience (all positive mind you). It’s a tricky spot no doubt, but I’m feel really confident with the results thus far (almost 3 weeks + out). Feel free to contact me at danamichelelambert@gmail.com. Hi Amanda, thanks so much for posting your details! My MOHS surgery was in the same location, seems common… Anyway, stitches were removed a week ago, except for the three inside my lip, which are not dissolving AT ALL, and poking my bottom lip painfully. Then this morning noticed something blue, thin and threadlike poking its little self out of the bottom of my lip, argh! Reassuring to read your tale and know that this swelling, numbness and small hard areas are normal. My little dot was Squamous Cell, only 1.5mm and a non-bleeder, but the hole Dr left was 7mm x 9mm. Plastic Surgeon did repair 4 days later. Don’t mind having a cool scar because I’m so glad to have caught it early. Thanks again for sharing! 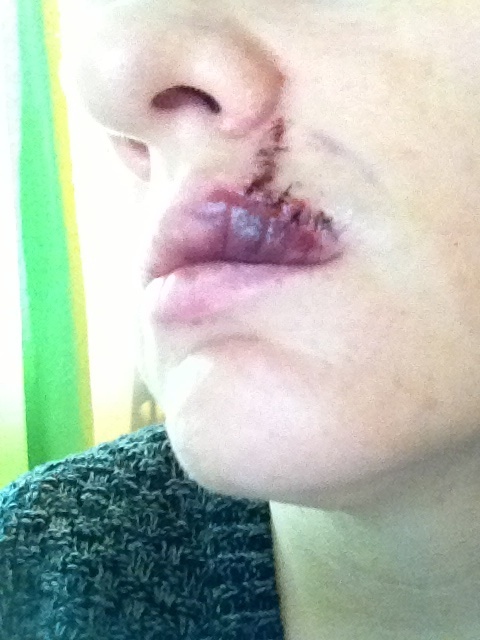 Linda–I too had a lesion about the size of yours, removed Sept 5 and still have two pokey stitches inside my mouth. Am told that they will go away on their own. I too had Moh surgery upperlip been one week today. Im using Vaseline and during the day when I go to work I apply a fabric band aide on it with Vaseline. You mentioned Kelo-cote how soon did you start applying that? Thank you so much for posting and for the pictures! you look great I can only hope mine can heal as well!! I don’t remember exactly when (I think it was after the stitches were pulled), but I asked my doctor and had a conversation about the right time to start it. I would ask yours in follow up and see what he/she advises. Just diagnosed on bottom lip and surgery scheduled I’m not fair skinned and scared for end results. A little bump appeared on my bottom lip out of no where , biopsied that week and of course came back invasive squamous cell 3x3x2 mm. Update ! Surgery was Jan 6th and my dermatologist removed it all and no stitches needed . Recovery now with bandage and antibiotic cream . She did note that sun damaged cells showed up in the slides so we shall see ! I was diagnosed with BCC on my top lip about 4 weeks ago. My surgery is scheduled for 12/16, with a MOHs specialist. The BCC is on the top lip right under the bow but on the underside of the lip. It was there for about 5 months before my hygienist suggested that I see my dermatologist. Before the biopsy, it was the size of a large cold sore. I have seen every scary picture on the web as well as reading several blogs like Amanda’s. Needless to say, the pictures have me freaked out. In reality, I keep telling myself , skin cancer is such a small thing, 1 in 5 get it and the survival rate is 90%+. I already battled colon cancer 15 years ago and beat it. The only rationalization I can give for being freaked out is vanity. This is my face that has to be cut and I am concerned about scaring. Silly! Hi! I started to respond and Google Chrome crashed. I think I’ll write a more detailed response tomorrow, but I appreciate your post! Marge–I too found this blog to be helpful during my initial diagnosis of bcc. I searched for the right path to take and wound up having my surgery on Sept 5, 2014 by a facial plastic surgeon. Yes, the pictures are a bit startling and I was unnerved to go through the ordeal. Thanks to another person, she gave me info on what to expect and I sooo appreciated the info. If you have any questions, you are free to contact me. I’m having mohs surgery done July 12th.on my upper lip.just had basal cancer removed from behind my left ear June 7th.getting stitches out the 19th.thank you for the information.I’m worried how my lip is going to be. Thank you for your courageous post. I hadnt been able to find anything like this post of yours in first person. I have to have Mohs surgery on a squamous cell cancer on dec 18 2014. The pictures and writing you have done here has given me strength and courage. Thank you so very much, Amanda. Happy Year to all of us MOHs survivors. I had my surgery on 12/16, with a specialist. He was able to get it all on the first try, but he did go deep on that cut. As I had said earlier it was on the underside of my lip. The reconstruction included a “Y” cut going right up to my nose. This allowed a flap to cover the cut in the lip and the surrounding area. I was able to change from the large bandage to two band aids after 24 hours and had to clean with peroxide and cover with vasaline twice a day. I had the stiches removed on 12/22, and went from the band aids to steri-strips which had to say on until they fell off naturally (12/26) . Like Amanda, I too have the numbness and came back today to read up to see if anyone else had it as well. I am still swollen and can feel the scar tissue but it scar is not too bad at all. I had no pain and honestly the worst part was the second set of injections to numb the area before the stitches and reconstruction. These went into the area directly under the nose and hurt. I go back for follow up on the 28th. Honestly, I would recommend my surgeon for anyone going through this procedure. Thanks to all for being here and sharing everything. Happy healing to all! Marge–Happy New Year, cancer free!! I had my surgery Sept 5, 2014 and still have numbness in my lip. My surgery went from right under my nose, and around into my mouth. My plastic surgeon did a cleft lip repair surgery, so I have a scar that is a line that extends from the right point of cupid’s bow, all the way under my lip and into my mouth. The underlying sutures can still be felt under the skin, but are getting better and less noticeable. I do think the numbness is going to be there for a while. But, it is gone, over and healing!! Best to you in your healing!! Did you go to a MOHs surgeon or plastic surgeon. I’m scheduled with a MOHs surgeon with 20 years experience. I’m feeling that he does more of these surgeries than a plastic surgeon. But he will refer to a plastic surgeon if need be. One can’t tell how deep it will be til they start procedure. How long were you it supposed to do any activity. I play lots of golf and tennis. Amanda, thank you so much for your post. My MOHs is scheduled for this Tuesday for a scc immediately above my lip. The unknown is scary. Thank you for sharing your experience. It is greatly appreciated. Thank you for sharing your pictures and story Amanda. I just had surgery on Monday and my stiches are similar to yours except for I have a straight line from the outer corner of my nose to my lip (two stitches on the tip of my lip). I am very surprised that I am numb from underneath my right eye, my whole nose, and 3/4 of the top of my lip. That is such a huge area to be numb! How long does the numbness stick around? The right side of my lip is still swollen and sagging a little. I am concerned that when I smile the right part of my lip will always sag down because now I have permanent nerve damage. Does your lip have any limited function or does it move the same on both sides when you smile? Nope, almost two years out and no droopy smile, but I remember that. I would say that within a year 98% of the numbness was gone. There is still a spot in the center that is a little nerve-dead but it is very small and I only noticed it when responding to your question and pressing against my skin, so not noticeable 99.9999% of the time unless my attention is drawn to it. Good luck with your recovery! I had two cancers on my upper lip, one on each side, and had mohs surgery November 2014. It’s almost four months out now and my scar are a lot less noticeable. The one problem I am experiencing is that there is less skin on my upper due to two wounds and my smile is now very tight. I’m not sure whether anyone else has this problem but I’m wondering whether I’ll have a more normal smile. I can feel “pulling” when I smile which reminds me of my scars. I had plastic surgery to remove the bcc on my upper right lip. The surgeon did a great job and the scar line is now minimal. I too however; feel I have a tight smile. My upper right lip is much smaller than my left side due to amount of tissue removed. My lip is also a bit numb so it doesn’t raise the same as it used to. At first I was a bit self conscious, but over time, I am forgetting that my lip looks/feels different. It has been 6 months now since my surgery. Amanda, thank you so much for describing your experience and showing pictures. I’m having Mohs on 3/19 in the same area as yours. My Cancer looked very similar to yours too. So it was very helpful to see pictures of what I can expect. Doesn’t look like fun, but a necessary evil! Thank you so much for posting this ( I wish I had found it earlier-LOL) I am day 1 after having MOHS surgery on my top lip ( right above/touching my lip line) It’s still very swollen, but no pain. Ice packs are my friend! I’d smile if I could so I’ll just use an emoji!😊 Yours healed very nicely! Here’s to all of us healing and to those who are taking care of ourselves! What a thoughtful person you are to share your experience……..and the pictures. That is just so helpful for the rest of us who have to face this ordeal. I just had MOHS on 6/10/15 – mine looked like yours as far as being in the same place…however I have bruised alot down into my neck and around my top lip and it is very swollen – I can see a bit of improvement as of today Sunday….I get my stitches out on Wed…..I am so hoping by the end of next week it looks alot better – plus I have some stitches into my top lip…..I haven’t been anywhere since last Wed….so tired of being in the house! Thank you so much for writing/posting! I had a squamous cell carcinoma in pretty much exactly the same spot as yours. I was COMPLETELY freaked out by the prospect of the surgery and resulting scar, which is odd, because I’ve had thyroid cancer and have a four inch scar across my throat, but somehow the idea of a surgical wound and scar right in the MIDDLE of my face really completely stressed me out. Your post prepared me really well, my wound was stitched in a way very similar to yours, the pressure bandage looked just like yours, and had I not read your post in advance I would have been TERRIBLY unprepared for the procedure. Thanks to you, I let everyone know I’d be working at home for a week to give myself time for the swelling to go down and the skin to close, and it’s been no big deal. Well, maybe not no big deal, but MUCH more manageable than some of the images online led me to believe, and very much as you described. I have been doing the before surgery internet search and am glad I found your site. Some of the sites by surgery centers are pretty graphic and seem to show very nasty large holes in peoples faces. I had a spot on my nose last November and the dermatologist i went to referred me for a radiation procedure. I had radiation on the spot 2x per week for 4 weeks. after the radiation was done i developed a very ugly scabby spot across my nose. it took about 3 weeks to get to it’s worst and another 2 weeks to slowly begin sloughing off. Now I have a spot on my upper lip and figured I would be doing the radiation again, however now my insurance is questioning the procedure and radiation is not being considered the “standard” treatment. Money and insurance reimbursement is involved so I will be forced to do the Mohs surgery which is much more invasive. I hope my surgery comes out as great as your’s. Again, I really thank you for starting this post. So glad you found this site to share your experiences. I found this site to be helpful during my situation with BCC. I too had a large lesion on my lip that required surgical removal by a plastic surgeon. It was on the cupids bow and was 8mm large. My incision went from under my nose, all the way under and into my mouth and attached to the inside of my nose. After surgery, I looked like a prize fighter for several weeks. I too was extremely concerned about how I looked and felt. My right side of my lip is now smaller than my left side. My mouth was noticeably tighter trying to open and use my mouth. The scar felt lumpy and really strange and my lip was numb. I too did not like to even consider lipstick and if I did wear it, I would draw the lines and try to fill in the right side of my lip. The nice thing about this is all this now happened 14 months ago. Today, I am grasping with the reality. I see myself in pictures and notice that I have chosen to not use or exercise my mouth. I now am stretching it, and smiling with a large smile again. The scar is less noticeable with the exercise and movement. I press on the lumps and they seem to be improving. I now will wear lipstick, just a lighter color than before. My smile is returning…not exactly the same…but neither am I a year later!! I am positive that this is improving daily and am not as concerned as I was last year. Time heals and this shall pass!! I wish you the best and you are always welcome to contact me!! Thank you so, so much for taking the time to write to me. I made a typo in the size – the BCC was 6.5 cm long x 3.5 cm wide x 1 cm deep, so what with margins and the skin flap, it felt like half my face was gone (although obviously not). Your email is such a blessing every word is encouraging (I’ve printed it out and am carrying it around in my purse!). I don’t know exactly why I posted on this site – it just seemed to find me – and while it sounds dumb, it’s such a relief to find somebody else with exactly the same issues who’s further along the healing road then I am. I looked at other sites but people there are like really seriously dying or have lost three lungs, etc, etc, and even though my face/mouth wound is important to me it’s nothing compared to lung/spleen/breast cancer or even melanoma skin cancer. I’m been wavering between feeling sorry for myself and isolated and feeling like a total wuss – so your email has helped me more than you’ll ever know. Am feeling very supported and encouraged and strong and ready to get to grips with the ‘new normal’! Again, thank you and bless you! I had my MOH’s surgery for BCC about 1 1/2 years ago (July 2014) and believe me everything you are experiencing and feeling is completely justified. You aren’t being superficial or vain – you’ve been through a pretty scary episode and recovery unfortunately doesn’t happen overnight – BUT, it does happen! bumpiness. My poor husband – he thought I was nuts, but hey! I had my lump removed with mohs on Nov. 2, 2015. I am still feeling tingly/numbness. Glad to hear it should get better. My surgery was not as large as first expected so I am happy about that. I had Brachytherapy on my nose last year at this time and that was 8 treatments over 4 weeks. The actual treatments were simple but for 1 month after I had a bloody nose every morning and had to sleep sitting up right. I developed a very large ugly black looking scab on my nose that lasted over a month. very ugly. At this point the Mohs surgery was less dramatic after the stitches came out. Hi Amanda – I too found the account of your mohs surgery very helpful and reassuring. Thank you! I’m about 3 weeks post op now. I went to a very skilled mohs surgeon in Boston. I had a plastic close it because my BC was an aggressive subtype and had been there many years so I wasn’t sure how extensive the wound would be. Fortunately the excision was still small enough (no more than 25% of the lip) to allow a straight closure. Mine was into the vermillion border so not sure a flap like yours would have worked but in my case both surgeons recommended the straight closure if possible. My lip joined up well but is considerably shorter on one side. Still, considering how much was taken out it’s really not as noticeable as I thought it would be. I’ve been using silicon tape at night and the gel during the day since the stitches came out and it does seem to be helping.The incision is still very red and lumpy in spots, though. I was wondering if this is normal after this amount of time so it’s helpful to read other’s experiences. .
Hi Becky – and Hi to Rhonda too! It’s very reassuring to know you’re not alone, isn’t it? Becky – 3 weeks is a very short time. I’m just over 4 months and it really does take time. Rhona, my dear – you could also be in for a long haul – depending on how deep/big the incision was. It seems to be OK initially, but (for me anyway) the swelling and the soreness comes and goes. I’m finding that the numbness doesn’t seem to be getting any less numb – if anything, it’s stiffening up more, but apparently that too shall pass – eventually! The waiting is hard, but there’s no alternative, unfortunately! Stay strong – and adapt! 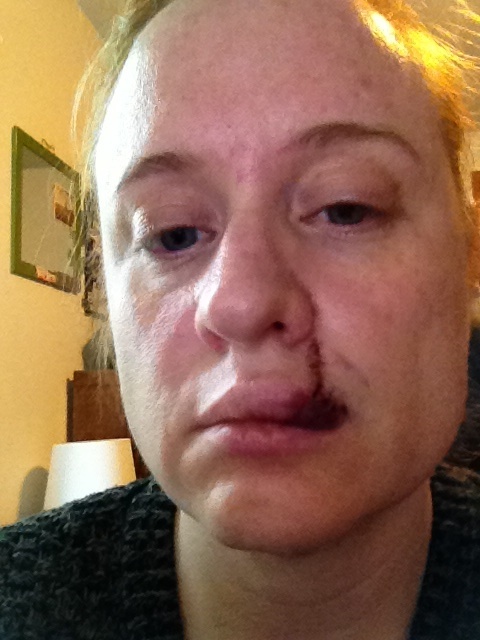 I am almost 6 months after MOHS….I posted a comment on 6/14/15 from mine….I still have the numbness and alittle redness – and also had a “little lump” in my top lip corner – I hope eventually the numbness and the lump goes away – but if it doesn’t – I can live with it! Just an added note about the numbness. My surgery was now just 14 months ago and I had a very large incision. There is still a bit of numbness, but it is getting better all the time. At first, I was afraid to move my lip as to fear that I would damage the incision or stretch it somehow. Once I got past the 6 month mark, I realized, the lip was healed and it was me that needed to stretch and exercise my lip. Now, it is feeling better and I am able to smile again without feeling uncomfortable. I have experienced surgeries before, and I know that no matter what, the incision will always feel a bit funny, just have to get used to it. All of this will get better. I am now waiting for an appt. to see Dermatologist regarding the lesion on top of my nose—ehh–oh well!! I have good surgeons already!! Take care to all!! i have had both the mohs surgery and the brachytherapy radiation for a skin cancer on my upper (mohs) and the radiation on my nose. pluses and problems with both but hopefully they both will have taken care of the skin cancer. my upper lip scar is a month old and still is bumpy and numb/tingly. i can cover it fairly well with makeup. the outside of my nose is very smooth, but he skin is very thin and i have a large blue vein that is about an inch long. it looks like i wrote on myself. also the inside of my nose is very tender and i get bloody noses easily. Hello all, I have read each account as I prepare for surgery on my BCC surgery on my lower lip on the 17th of February. I am a teacher so I am concerned about being able to speak clearly and without drooling which I found to be a problem after the biopsy. Each of your posts has been helpful in preparing me for this surgery. I have had many surgeries over the years having GIST cancer, a C-Section and ear/nose/throat surgeries; yet this one concerns me significantly. Thank you all for your posts and I will keep a positive mindset as my date gets closer. Dear Patricia. You’ve already had a hell of a time – this one’s probably worrying you because a) it’s yet another darn operation/illness and b) it’ll have visible, physical after effects. Poor baby! From my own experience (6 months after op on upper lip) – the bad news is that you most likely won’t be able to speak clearly (you’ll probably sound like a bad ventriloquist) and you may well drool a little bit. The good news is that it does get better. Mine took a bit longer than I expected, but all of a sudden (literally over the past week) a whole lot of sensation has come back into my lip. Nerves only grow 1mm a month – plus they have to battle to grow through the scar tissue which is a really big deal for those tiny, tiny nerves – so you need to be gentle with them (and yourself) and just let them get on with healing. A side effect that I’d not expected was not being able to close my mouth properly while I was sleeping – so I’d wake up with the worst dry mouth and throat and headaches – that too has now stopped, plus I can even drink from a bottle (previously I’d spill it all down my front if I didn’t concentrate on pursing my lips properly). Everyone is different in terms of recovery/side effects/actual procedure and damage – but we’re all exactly the same when it comes to worrying. All I can say is, it’s cancer for heaven’s sake – not big bad melanoma cancer – but it is cancer and it’s as much a shock to your mind & emotions as well as physically to that poor little lip of yours. So yes, you’re a teacher – and you’ll still be a teacher afterwards, you’re just gonna be a teacher with a bum lip for a while. Love that lip now while it’s damaged and especially afterwards when all those thousands and nerves and all those little muscles will be doing their very best to get all healed and better. It’s a tough job, but they will get it done. Timewise?? It takes as long as it takes and you just need to plod on through it. My healing wasn’t step by step – it often felt like it was getting worse or I was going backwards. It’s all normal says my wonderful plastic surgeon so I too am still plodding on – some days are trudges, some are hoppy, skippy days – but always at the back of my mind is the encouragement that hundreds if not thousands of people have been through this, or are going through it – or like you my dear, about to go through it – and that I’m not alone. And nor are you. Promise! Dorothy thank you so much for your encouragement! Initially I was not overly concerned then I realized what this might mean in terms of recovery both personally and professionally. My admin was not too helpful suggesting that I need to have forms completed for Family Leave which has led me to think they don’t believe I will be able to continue to perform my job. I just need to take a step back and know I can get through this as well as each of you have done. I guess I will just think of this as a Lenton penance to work diligently each day to overcome my self doubt and vanity to enhance the recovery process. Thank you once again for posting such encouraging words and I will post my progress sometime after my surgery next week. Patricia–I woke up today and looked in the mirror and what did I see? I little tiny spot that was my bcc cancer almost two years ago. I found this link when I too, was scared and diagnosed with a very large lesion on my upper lip that required plastic surgery to remove. I researched, found pictures, and reeled over what I may or may not expect. Then a lovely girl gave me her “play by play” account of what she experienced. I am forever touched by her kindness and help. In reality, the first few days are a blur. You will be swollen, and bruised, and look like you were in a fight. After day three, the world begins improving quickly. Yes, you will be numb, and it may take months, if not years to improve. I worried if I would ever feel a kiss again!! For the first six months, I felt self conscious and would not smile. My husband and others said that it looked fine, but to me, I still noticed. I finally saw myself in some photos and realized that I should start exercising my smile and what do you know? My smile is normal!! I can speak, I can kiss, I can put on lipstick, I am completely healed and normal!! So, we have cancer–a cancer that is treatable!! We always will deal with this and new lesions (I have had 6 more removed since). But, it is going to be alright!! Give yourself the time to heal, and the love and support of people around you. Since you are a teacher, I am sure you will share your experience with others to help them when the time is right. Best to you, and if you need a “play by play” we are all here for you. Feel free to reach out!! Kim thank you so much for your encouragement. After having been diagnosed 5 years ago with GIST cancer I have learned to deal with these hiccups along the way. I am grateful for the support from others like yourself. I guess at this point I just want to be on the other side of this surgery. Thank you so much for taking time to share you experiences and hope for me. I will keep you posted on how things go in the interim my gratitude to you. Hi all you wonderful people who’ve commented on this particular blog post. I tell my dermatologist about you all and how I am glad I did this. I wanted to let you know (if you’re still reading) that I had part of my ear removed and reconstructed a couple of weeks ago for a different growth. It (amazingly) was not nearly as brutal looking or as painful as the Mohs but just a constant reminder to keep vigilant with the sun protection. Good luck and keep posting. I love reading your comments and how supportive you all are to each other. Amanda I had the ear done about 5 years ago and did not find it that offensive. My dermatologist did the work in her office and the recovery was uneventful. You are so correct about the need to be vigilant with sun protection. We have a home at he beach and I absolutely love to sit on the sand and enjoy the fresh air. I am always under an umbrella and always use sunscreen but apparently my skin just will not tolerate my passion any longer. I am so grateful for finding your blog and all the others that were willing to share about their experiences. 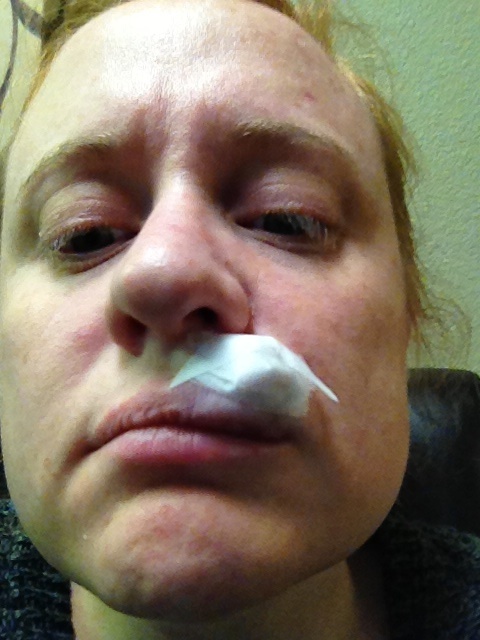 I had MOHS surgery on my upper lip – almost the same spot as yours, on Feb. 19th. I had to get a skin graph with a v y flap closure. It was more extensive than I had prepared myself for. My closure is an angry red. I went back to surgeon yesterday to check for infection even tho I have been on antibiotics since day of surgery. She gave me a topical antibiotic for extra measure. Anxiously awaiting to get stiches out tomorrow! All that said, your blog helped me on an emotional level that I didn’t really needed. Can you tell me how long it was before you could use makeup to help cover up? I am an elementary art teacher and have 375 little ones that will be focused on my lip and not my lesson ; ) Thanks again – wishing you happy healing on your recent procedure! Hi, I am just going this week for diagnosis on my biopsy but the dermatologist is sure I’ll need the MOHs surgery. It’s all quite frightening as mine is already very large. Below left nostril and above upper lip. Im so frustrated that I didn’t go in sooner to have it looked at, it just never, ever dawned on me that it could be cancer. Tried home treatments like tea tree oil, etc, until it would not heal. I’m terrified of what my face will look like if it grows like tree roots. Amanda, thank you so mucy for having posted your experience for us all to find. A few weeks ago i was told I’d need to have Mohs in nearly the exact same location as yours, on the right side. I went immediately online to find out what this meant, and thankfully came across your site. There are many medical sites out there explaining Mohs, but none do a good job of telling you, in real terms, what to expect during the procedure, how it will look right after the surgery, and what will happen during the recovery and healing process..Your site gave me all of that and prepared me for what was to come, and for that I am truely grateful. I had my surgery a few days ago and everything has been as you explained. I was very thankful and mentally prepared going into the surgery room knowing what to expect in large part from what I learned here. Thank you! I just had my surgery this past Friday. Great surgeon, fabulous bedside manner but concerned about what this will mean for me professionally as my business is facing the clients and fashion forward. Already concerned about my smile. Face feels frozen but I must say I was pleasantly surprised when I was able to take off the bandage today. Didn’t look like the Frankenstein I had imagined but definitely distorted. Almost looks and sounds like I had a minor stroke. So encouraged by all the comments here, God was definitely guiding me as I navigated the web, so fortunate to have found this site! Still amazed that something that literally popped up overnight could have caused something like this. I thought for almost a week that it was adult acne. Thank goodness I saw my dermatologist right away. I’m curious about the kelocote and silicone tape-can someone tell me exactly what they are/do and where to buy? Thanks so much, I feel a kindred spirit with all of you, now. I, too, had been feeling selfish for being vain, but now I realize that it’s not really that as much as having to, literally, face this every day. Glad to hear things are going well for you!! I remember how nervous I was 2 years ago when facing this similar dilemma. But now, 2 years later, my scar is barely noticeable. My plastic surgeon recommended Biocorneum to use on the site. This is a silicone gel that has spf30. I put it on morning and night for 6 months. It is a great, clear, way to cover the scar/wound and protect at the same time. I just had my second round of squamous removed from my chest and am using this product again. Wishing you the best in your recovery!! I’m scheduled for MOHs 8/8 on upper lip and above. The biopsy is a simple scrape and I was hoping that to get the rest of the bcc it would take just deeper scraping. But it seems like most of you had much deeper surgery. I’m more concerned about recovery time as I’m very active. I’m going to a MOHs surgeon with 20 years experience and he will refer to a plastic surgeon if need be. But he is able to handle most MOHs surgeries himself. Guess one doesn’t know til the doctor starts the procedure. Thanks for all your stories. But they have scared me more as I didn’t realize this could be so complicated. Boy, I remember what it felt like 2 years ago when I was facing this similar situation. Mohs is the preferential treatment as long as it does not cross the vermillion (pink part of lip). Once it goes into that skin, there are blood vessels that need to be considered. Or if it affects the Cupid’s Bow, you may want to have plastics correct the issue as Moh’s will just remove the lesion. Mine went into the vermillion and Cupid’s Bow, thus needing plastics. The good news is it will be over soon, and you will be well on your way to healing! We are hear to help if needed!! I just had this surgery done 10days ago. I’m glad I found this blog because I have felt so alone. They had to remove half the top of left part of my lip & above my lip. The first few days were very uncomfortable and today I am just now starting to eat again. I feel like it’s never going to heal. What did you apply for the first month? U have been applying Vaseline and leaving it uncovered for 3days now. Ahhhh, Missy. Yes – this blog is a blessing, I’ve not found one like it. I also felt alone and that nobody understood. I didn’t want to talk to a ‘proper’ cancer support group – these are people who are actually dying, so a BCC op felt like I was doing the whole ‘first world’ problems/’poor me’/wussy thing. Family and friends commiserate but only people who’ve actually had Mohr’s surgery can relate to the actual physical, mental and emotional effects – big and ‘small’. Ref your feeling it won’t heal – I don’t want to disillusion you, my dear, but it could take months to heal. Obvs people are different, but my op will be a year next week (26 July) and I’m probably still only about 90% there. My cut was 7,5 cm long, 3,5 cm across – from the middle of my top lip right across to the edge and 1 cm deep (right through the depth of my lip). It was like a huge triangular cake-slice shape. I’ve always been a red lipstick and black eye pencil kind of girl, so not having a lot of lip was really hard – it sounds stupid but I was more upset about having a mouth like a mouse’s bum than the actual cancer! I had rodent ulcers and they were all inside and underneath – all you could see on the top was a tiny little sore where one come up to the surface. There were another five or six all growing and merging underneath – but of course I didn’t know that until the path report after the op. I was like, what the eye doesn’t see, the heart doesn’t grieve over! Now my scar is brilliant, I’ve sorted out the lipstick issue (was back to scarlet in a few months – still looks a bit odd, but I just think “Screw it!” and do it!) There’s no muscle damage, so I can smile, there’s just a bit of numb tissue where the nerves are still growing back. Once it’s healed, you can use a tissue oil or Vit E, but while it’s still stitched you need to keep it clean and moisturised. I would think that Vaseline would keep it too oily and the skin wouldn’t have a chance to dry? Whatever you get, while the stitches are in, just pat it in gently, but once the stitches are out, you need to massage the top (and underneath) quite firmly (but obvs not enough to hurt). You need to try to get a finger inside your mouth and one on top and sort of gently rub them together. This helps with scar tissue, muscle mobilisation and also helps all the little nerves. There are thousands in your lip, and they only grow back 1 mm a month – it’s tough fighting their little way through that sore tissue/muscle, so you need to be really patient and kind to them. It is a traumatic op – not so much physically like a heart transplant or an amputated limb – but because it’s on the face (and so visible) and the mouth, so you speak funny, can’t eat properly, etc. I felt like one of the Kardashians for months – was convinced I had a huge trout pout and that my lip was touching the end of my nose – but of course it wasn’t! It just felt big! I still occasionally battle with eating – chomping on a burger is not a pretty sight – and I sometimes dribble a bit if I drink from a bottle and don’t concentrate on pursing my lips) but I just laugh it off – or eat/drink in private. People can lose half their face, or a nose – even an eye – but it’s so very personal – just losing a cm or two really rocks your world! You’re doing really well if you’re already eating! I was like Rainman for a month – tiny, weeny bits of food on a toothpick! Sorry this is a bit long – but at least if you go blind from reading, it’ll take your mind off your mouth (lol! ), but I must say that your mental attitude is key. Be as kind to yourself – and particularly to your mouth – as if it were the most special, loved family member or friend or pet. We’re often much kinder, gentler, empathetic and understanding to others than we ever are to ourselves. Your hurt (or ‘eina’ as we call it here in South Africa) will do its very, very best to heal – don’t get in its way by being impatient or critical. Rub your cream in with care and love. Take LOTS of bubble baths – a chocolate bar, or other yummy treat, eaten in the bath is even better. (And it’s easy to wash off the dribble!) Slow down, rest, buy flowers (doesn’t have to be a dozen roses, just a little bunch – or even one – will nourish your heart and replenish your soul. You may or may not have the aftereffects/symptoms/mental or emotional feelings that some of us on this forum have. You may or may not have a scar, but even so, never be ashamed of a scar. It simply means you were stronger than whatever tried to hurt you. And you’re stronger than you could possibly know… And you are NOT alone! It’s good to hear the aftermath from people who have gone through this. One thing I might mention–doctors want you to NOT use antiseptic and medicinal ointments for a number of reasons. They can slow down healing and also allow resistant bacteria to get established. You don’t want a tough infection to get going! As a retired veterinarian, I can attest to the importance of this. We tend to overuse antibiotics in the U.S–casual use, poor frequency, and underdosing can lead to big problems. So I’ll be using just the vaseline unless there is a specific reason to do otherwise. My 48-hour post-op pressure bandage comes off tomorrow. My two biggest issues are all about appearances. A) I’m vain. I hate having a big “thang” to draw attention. B) My first children’s book comes out this year. That means readings at libraries, schools, and book stores–if I’m lucky! I am worried about kids being scared or put off or not paying attention because all they can see is the big scar on my face. Dang. What timing. They took a big old divot out of my upper lip. Took 4 excavations, as I call the rounds of excision, and a V to Y plasty to reconstruct the area. I’ve had to do that sort of thing on dogs. But dogs really don’t seem to care about scars or even if they are missing a leg, as long as they are loved and can play and eat. I need the same philosophy! Tomorrow I get to see the initial appearance. Wish me luck. I do wish you luck. And no matter what you look like – I’ll love you like my dog … LOL! Thank you! It’s not too bad, all things considered. After 2 weeks, my upper lip is almost symmetrical, and the scar looks like a big, red “This Side Up” arrow. Handy, that–now I wont’ get confused! It feels weird as heck: like someone replaced a chunk of me with a piece of leather. I get electric tingles, and itches, and occasional deep pain. It feels better with gauze covering it. Fewer electric zaps. And I’m less likely to claw at it. Hiya! The electric tingles are totally normal – my plastic surgeon has a proper medical name for it which I can’t remember. Something to do with the nerves reconstructing themselves. It’s all part of the healing process! Glad to see you can still joke about it! I look back on your funny reply and laugh, six months after my surgery. Dorothy, your dog is very lucky! Missy- I forgot to mention I used scar gel and also Metipak tape I got on Amazon. Actually the Metipak tape worked better to me and it’s a lot less expensive. I used it at night and the gel during the day since it was invisible. Thank you for a very clear description of your experience. Mine was a little different. My carcinoma had been there about 10 years. I went to two other dermatologists over that time, who refused to biopsy it. Finally someone did, and yesterday, it was removed from almost the same location as yours. It took 4 rounds and about 30 injections of local anaesthetic, which were all quite painful. I have a low pain tolerance and can’t take the kind with epinephrine in it. That ingredient cuts down bleeding and extends the pain block. So I had a lot. The whole process took about 4 hours. Not the most fun day for a person with a needle phobia! They did a V-to-Y plasty to reconstruct the area, and tomorrow I take the pressure bandage off to see what it looks like. I’m thinking of adopting a piratical flair to my wardrobe. Ha! But everyone’s scars seems to look quite good after a short time. Like you, I am a big believer in sunblock. I’m also very fair-skinned and a recluse/couch potato/computer nerd/bookworm by nature.I’m hoping this doesn’t scare small children–my new children’s book comes out this year, and I had planned doing several readings in libraries and classrooms. Maybe I can wear a mask–sort of a Phantom of the Opera with Whimsy kind of thing? Thanks for your informational blog! Thanks so much for giving a patients viewpoint. The support is appreciated greatly. Mine is a reaction to the antibiotics and maybe the numbing agent. Yes, the avoidance looks from strangers and I realize, you too some day, hopefully not. Again thanks. Please show us how it looks now???? About to embark on this; thanks for your post! Oh, I just found the pic; thanks! This is a great blog, thank you! Can someone please answer some questions I have, if you’re able? I have a basal cell on the upper lip, right in the middle under my nose in the pink area of the lip. I haven’t had surgery yet, but I’m so worried because I’m a newscaster on the radio. I HAVE to enunciate! How long will it be until I’ll be able to sound normal and go back on the air? I’ve had consults with two MOHs surgeons and two plastic surgeons. I find it unsettling because nobody can give me answers since they don’t know what will happen until after they cut. I’m also worried about what I’ll look like. I’m still single, and I guess dating is out for a year or more. I live alone and have no family, so I’m going through this alone. I’m going to drive myself to the surgery and drive myself home. Then I have to go in for a revision a few days later with a plastic surgeon. Im also worried because I have an old dog that can’t do stairs anymore and I have to carry her up five steps to get her in the house. She weighs 55 pounds. Will I be able to do this after surgery? I have to. And I’m a lap swimmer..how long until I can swim again? I’m so upset over this. Hi, I had a fairly big basal cell in the same spot, except under one nostril. I read every horror story on Mohs and in the end it was removed and I only took 2 weeks off work…and was anticipating months off work, possibly. Im a therapist that sees people all day long. So go in with an open mind. Follow aftercare instructions to a T and it helps alot. But theyre correct in that until they do surgery they wont know how much needs removing. Hi Lisa, first things first: lifting anything more than about 8 pounds after surgery is contraindicated. You don’t want anything that will put pressure on that incision line, and lifting increases blood pressure, causing more fluid leakage. Your doctor will probably tell you that or it should be in the discharge papers. If you want a clean and uncomplicated recovery, it’s like any other incision in that regard. I was swimming laps and had to stop for two weeks. The sutures came out at 1 week. Then you need another week for the holes where the sutures were to seal up. Pools are notoriously dirty, despite the chlorine. You don’t want an infection to make scarring worse. Second, about how you will sound. So much depends on exactly where on your lip the incision will be and how much tissue must be removed. Mine extended from about 1/4 inch above the lip, at about 1/2 inch from the midline. Enunciation was affected for a day from the local anesthetic–just like going to the dentist–but then after that wore off as long as the pressure bandage was in place. That was a week. After that, it does depend on your incision. I wore a bandage for a couple of weeks longer, since it reduced the itchy feeling for me. My enunciation was not affected by that light bandage. Talking to plastic surgeons sounds like the best bet for long-term return to normalcy. It sounds like you are doing all the right things. Best wishes for a quick and painless procedure and an uncomplicated recovery. You are going to be okay! 1) First things first. You are going to be okay! Do follow your doctor’s orders about lifting things. It’s recommended you not lift things greater than 8 lbs.–about a gallon of milk. So you’ll need to make arrangements for your dog. This is because lifting increases blood flow, and that can mean more bleeding at the incision, pulling stitches, etc. 2) I swim laps and had to take 2 weeks off. The sutures came out in a week, but then you need another week for the holes from the sutures to seal up. Poos are notorious germ repositories, despite the heavy chlorine that is used. You don’t want that surgery site to get infected. 3) Enunciation will be affected immediately after surgery if they use local injections, just like getting novocaine at the dentist. That lasted about a day for me, since I had so many injections. The pressure bandage stays on for about a week as I recall. Depending on placement of the bandage and tape, that could make a difference. You may just have to overcompensate for clarity. But you really need the pressure bandage to prevent complications due to swelling. Past that, it depends on how much of your lip is involved in the actual surgery. That is, how much tissue is being removed. My incision was above my lip but did not extend into my lip at all. My lip stayed swollen for weeks, but my lip mobility and hence enunciation was not affected. It sounds like you are doing all the right things by getting multiple consultations. It is true that until they get in there, they don’t know how much tissue will be removed–that’s why they do the Mohs, to take a little at a time until they get it all. This procedure takes the least amount of extra tissue and still has a high success rate of complete removal of the tumor. Once the incision is healed, you may experience stiffness of your lip. As your surgeon about when you can massage the area to prevent excessive collagen/scar tissue and decrease contraction of the scar, which makes it hard. I use petrolatum (Vaseline) and do light massage, plus I do facial exercises like singers do to keep flexibility in my upper lip. It was really thick and hard for a few weeks but has become more flexible over time. I didn’t have any problem talking during any of it, but the area felt strange to start due to numbness and itching. Best wishes for a smooth surgery and hasty recovery. Thank you so much for all of your information! I just had the surgery in a similar location just above my lip. I am so upset by what it looks like- my lip on one side is totally a different shape than my other side. The surgery side is pulled way up and there is a little popped out area that looks like it was puckered out from being pulled together. I don’t know if this is going to go away. I had my surgery 6 days ago. I can’t get used to my face looking like this. I’m fine with the scar but it looks like I am scowling on one side now. 😦 Did your lip looked deformed and it fixed itself eventually? Hey, Rachael! I’m a veterinarian, not a physician, but the same principles of healing apply. You are likely to look like a prizefighter for a couple of weeks. Your skin is reacting to a bunch of trauma. Any incision will swell, but when you take a chunk of tissue out as well, there is space there, despite the best efforts to suture it all closed. Cells have been damaged and have to repair. Seepage of intercellular fluid has to be handled by the body. Follow your doctor’s directions for quickest return to normal. Deep breaths! Give your body a chance to do its job, and don’t look in the mirror except to evaluate for infection, etc. You are going to be okay. Hello–I too found this blog several years ago when I had my bcc removed on my upper lip. I had my removed by a plastic surgeon as it extended through several different types of tissues. The scar goes from under my nose and wraps into my mouth. It was the repair surgery for a cleft palate. Now, some 4 years later, I have had some fillers placed in my face to accommodate for the inconsistencies in my lip and my smile. I am very happy with the results and feel like it has shaved a few years off of my face and age. So, time and patience will heal all. No one will even notice!! I have been periodically checking back on this thread as I’ve been healing from my upper right lip Mohs procedure on 1/11 this year. I had the same type of closure as you, except mine starts just under the side of my right nostril and extends down and wraps into my lip. I think it’s healing well considering it’s been a little less than a month…my lip still has a decent amount of residual swelling in the right half of my lip which makes me look odd as my upper lip is not symmetrical due to the swelling. I already have naturally plump lips so the concentrated swelling makes me look weird and I almost feel like it makes closing my mouth difficult and uncomfortable, like my bite feels different or something. Did you have this issue as well? I’m curious to know how long it takes for all the swelling to completely dissipate, it almost feels like my lip became more swollen/puffy in the past couple of days compared to last week and now I worry that my lip will stay puffy and shapeless forever :(. I can start scar massage in a couple of days so I hope this helps with evening everything out and clearing some of that swelling. I can still feel the internal sutures so I’m not sure how hard I should be rubbing. How long did it take for your lips to look normal again and have the fillers helped to give your lips more symmetry? I’m worried about how distorted my lip is going to look when I’m done healing. I can tell that the right side of my upper lip is shorter and I wonder if fillers can be injected in the lip corner to help elongate and balance with the left side of the lip. I also have two indents on each side of my incision line, I’m guessing this is probably due to the scar contracting and hope this will eventually flatten out. If not, I’m wondering if fillers can help with that as well or if you can’t inject into hard scar tissue? Hopefully I won’t need them by the time I finish healing but I’d love to hear how they helped you. I have an appointment with my derm next month to review how everything is healing and discuss laser & dermabrasion. How are you doing now, Becky? I hope you are through the worst of it. If you are interested in a visual history of how my incision looked, check this out (If Amanda Rose allows links). I may copy this into the main thread, too. Thank you for your blog. Going for Mohs’ consult on Monday. I have also had a lot of issues with gum ulcers on that side, between the molar and the cheek, and pain under my ear; I hope to God that the BCC above my left lip (just like yours) doesn’t have its roots extending into my mouth. Is this even possible? I am not a doctor (only a veterinarian). Nonetheless, I can send you the reassurance my surgeon gave me. Basal Cell Carcinomas are very slow growing and tend not to metastasize. Do double-check with your own physician. Everyone’s biology is different. I had mine almost 10 years before I could get a dermatologist to biopsy it. It grew but stayed localized to my lip. Stay strong. You’ll get through this fine. Hey, and check with your dentist or better yet, a periodontist (for gums)! I have lots of dental problems on the same side that are completely unrelated to my lip tumor. Thank you, Diana. I guess I should have mentioned that I had a molar pulled on the upper left side two weeks ago. The ulcer seems ot be right above or right in front of the pulled tooth area. Either they nicked me with their tools, or the old ulcer is flaring up, which I was really hoping would be eliminated once that molar is no longer making the space tighter. I just find that it is not going away with my usual and new treatments like mouth rinses, coconut oil pulling, etc. I had a lot of the same worries before my surgery. Strange sensitivities under my lip and gum sores near the basel cell. The doctor assured me they were not related and he was right. The basel cell, which had been just above my lip at least 8 years, was very localized. It had not grown or spread that much, even though on biopsy it turned out to be one of the more aggressive forms of basel cell. I found a mohs surgeon who does these all day, five days a week and he was able to very accurately estimate the size and outcome of the wound and got it all in one pass. Of course they never know for sure until they get in there, but a doctor with thousands of surgeries under their belt will have seen enough to have a pretty good idea. I also found a highly rated plastic surgeon to do the close. I have a scar that runs from my nostril through and under my lip but with a little make up it’s really not that bad considering the size of the wound. Hi….Trust me when I say that I looked awful for the first week….improved the 2 no week and I returned to work the 3 Rd week. I had a relatively large BCC removed between my upper lip and nostril 9 months ago. Many people have said they’d never know if I hadn’t mentioned it. I still see the scar on my lip which bothers me the most, however easily workable with lipstick. The puckering and most swelling is pretty bad the first week. I strictly followed the followup care routine they gave me. I am positive even 2 weeks from now you will feel much less anxious about the swelling as it WILL lessen! I will have to see what happens at the consult on Monday. Please pray for me. You are going to be fine, Elke! You won’t be freaky; you’ll just have a bandage (keep that pressure bandage on for good healing and minimal scarring). This blog is a blessing! I, too, have just had Mohs surgery in the same spot as you and it’s the best example on the web on what to expect as my experience is similar. The worst part, for me (besides the shots to numb my skin), was trying to eat and getting used to a big, bulky bandage. I’m using a straw for mostly everything. Sleeping is also difficult as I’m supposed to keep my head elevated, and it’s not a natural way to sleep for me. 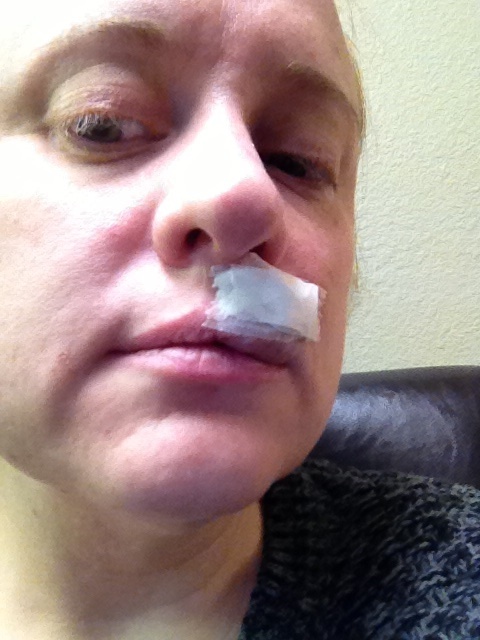 The bandage was (and still is) ghoulishly big as I have stitches from my nostril down to past my lip line. I hope to return to work the day after I get my stitches removed, but I don’t know what to expect. Will it still need to be covered? Do I still need to be careful with talking and eating? Of course, the dermatologist’s office will answer these questions, but I’m curious if anyone can advise. Thanks! Hi Amanda, is it okay for me to post a link to my MOHS gallery? If it is, dear readers who are going to have a MOHS surgery but haven’t yet, don’t get freaked out by some gross pictures. I posted close-ups and farther away photos to show you that it looks icky close up in the mirror but not as bad as you think to people around you. And look at my untouched photo at 6 months (which is NOW as I’m writing this). By the way, I used vaseline all the way. I researched Vitamin E, since I’d heard so much about it reducing scars. They did some double-blind studies, and it turns out Vit E does nothing. However, it is an oil. Any oil with light massage (once your doctor says it’s okay, not before) will have the same effect as Vitamin E for lower cost. They recommended Vaseline, as do several major, respected dermatology hospitals. It seems to be working for me. And keep sunblock on it all the time. UV light makes the scar redder. I, too, used Vaseline as per the doctor recommendation. I didn’t have sick leave either, so was grateful it wasn’t too long off. The only “glitch” with BCC is they often can’t predict the extent of it until surgery day. That being said, it will not be too long, and just remember to not judge the outcome based on the first few days/ week, while it’s still swollen. Good luck with the consult! Thank you to everyone who answered my questions. I had the surgery the week after Thanksgiving. As I mentioned, it was on the pink part of my upper lip, right smack in the middle. It turned out to be about a quarter inch round… I had two rounds of MOHs. I went right from the surgeon’s office to the plastic surgeon. He had to cut a flap and close it with tiny stitches. I was out of work three weeks because I talk for a living on the radio and my upper lip was tight and numb. Now, It looks amazing! I lost a little of my Cupid’s bow, but unless you really looked, you can’t tell. It’s still a little numb, but getting better every day, and there is a little scar tissue. It feels like a pea. I’m told in time that will go away. And yes, I had to carry my old 55 pound dog up the stairs. I had no one to help me.. But it turned out ok. I’m back in the water swimming laps. I had the Mohs surgery on my left upper lip a week ago. One pass was all it took and the hole was 9 mm. Afterwards they sent me to the plastic surgeon and he did an advanced flap. I had a very swollen lip but only for two days and I am amazed at how much better it looks just one week later . It looked much worse with the black stitches in there because it looked like a big scab. Yesterday the stitches were pulled and you can literally not even see it from a few feet away. My plastic surgeon said I am a excellent example of a fantastic surgery result . I would love to post some pictures but do not have a website to do so. If anybody can tell me how to post pictures on here please let me know. But I completely forgot to mention to him yesterday that sometimes I get a stabbing pain inside my incision and some burning. Is that a normal process in healing? I’m glad all went so well, Elke! And yes, the “zingers,” the stabbing and zapping pains with some burning was normal for me. It continued over the next several weeks, but with longer intervals between zingers. My excavation was a tad larger. Hi I had a beauty mark above my right lip and I saw a change in it!! Went to the dermatologist he took a biopsy and it was melanoma!!! But it didn’t go anywhere !! So I had a plastic surgeon do the surgery!! 99 percent cure rate!! I’m 5 months out and my lip does feel like someone punched me!! Still feels tight and I find if I eat anything spicy or hit it irritates the under part of my lip and it gets puffy because there were inside stitches!!! I use scare guard and it helps the scare!!! I’m also massaging area and I know it’s going to take at least a year if not more to heal!!! So if anyone out there is in same situation as me I know how you feel!!! Thank you so much for this. I have a BCC in the same spot, and have my Mohs surgery tomorrow morning. I REALLY appreciate your post and photos! Thank you!!!! Hello I had my upper lip done a month ago.my Dr was amazed how well I healed up.he did a wonderful job,hardly can see the scar,just have a little numbness. Hi, I had Mohs over a year ago on my upper lip. When the Doctor completed the surgery he told me he had removed all the cancer,, but the area was to large for him to close. He said he was sending me to a plastic surgeon. I went to outpatient surgery three days latter. The surgeon made a much larger incision and closed the wound. The stitches were removed a week later. The area was very numb. three months later when I returned to the surgeon for a follow up. The surgeon said he thought the lip looked great.. I told him the area was still numb and I had an area where the skin peel off in a large patch once a week. Six months later the surgeon told me that I would always have the numb feeling and the skin would continue to peel . There wasn’t anything he could do. It would been better if he had disclosed that info before the surgery. If anyone here remembers me – I had seven rodent ulcers removed in July 2015 (one had broken the surface, the other two were hiding) – so obvs excision site was huge (6.5 cm x 3.5cm x 1cm deep). Have been doing so well, physically, mentally and emotionally – but was diagnosed yesterday that there’s another one breaking through in a different place. Could be new or related to original cancer(s). It’s right next to my nostril, in the crease, so I don’t know how on earth it could be cut out. It’s also so, so, so sore – unlike the previous one that looked like hell but didn’t hurt. Doc prescribed Aldara cream saying it will both bring the ulcer out and remove it – which is how we found out yesterday that we thought was just a little pimple on Friday is worst case scenario (after the doc said there was only a 2 percent chance that it was cancer. I’m so down and devastated and upset – and like “2 percent, my ***, yeah right”. And scared. I had MOHs on my upper lip a year ago. Following the surgery, I had a hole about half the size of a dime. I went immediately to a plastic surgeon who cut it a little more and stitched me up. The plastic surgery was not covered by insurance, but was worth every penny! You literally cannot see I ever had surgery! I lost a tiny bit of the Cupid’s bow, but it looks great! I’m still a little numb in my upper lip, but I don’t even think about it. I’m hoping all feeling comes back, but if it doesn’t, it’s so minor, I can’t complain. If you’re worried about the surgery, it was a piece of cake. I had two rounds. The only thing that was uncomfortable were the numbing shots. I was able to eat normally within a few days, and since I’m allergic to narcotics, took no pain medication at all. I had a little soreness, but no pain. Just make sure to use Ice, ice and more ice! Don’t worry! The anticipation of the surgery was the worst part. I am so very thankful for this blog and all the great information, pics and thoughtful words that were shared here. 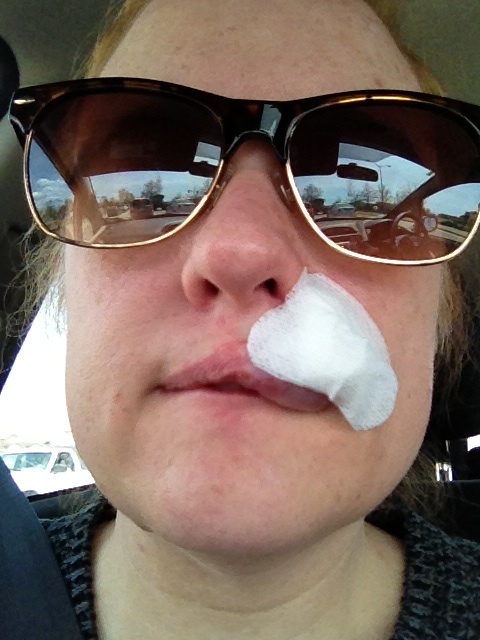 It was an incredible help to me as I prepared for my Mohs surgery on my upper lip. My Dermatologist removed all of it the first time. I had reconstruction surgery this afternoon by a plastic surgeon. My stitches will be removed in 6 days. I had no idea you could have a Basal Cell Carcinoma on your lip! I just thought it was a dry patch that would bleed then heal… I’ve had it for about 7 years. I’m so glad it has been removed and look forward to healing. Once again thank you for making this process easier for me because of all the valuable thoughts, comments and great advice! Thanks for all of the posts, as many years as they cover. I’ve just had MOHS surgery (on my 6th day post-op) on my left chin. I too was led to believe that the lesions were not BCC, as they did not present as such. They acted more like a pimple, and actually got worse when I consumed chocolate! I let it go on too long, so I was pretty anxious when it was finally diagnosed correctly in early January 2018. I had one biopsied at my dermatologist’s office, and the 2nd one at the specialist’s office 3 weeks later when I pointed it out to him during the consult for the initial lesion. SO much fun, those external anesthetic injections! I’m a dental hygienist, so I joked both times that this was karma for all the (relatively painless, especially compared to these chin injections) patients I had to get numb for intense dental procedures. Oh well. I was prepped to be at the MOHS surgeon’s office for the better part of the day, and most of the multiple people I knew who had endured MOHS had indeed spent at least 4 hours and experienced at least one call back for more curettage of their lesion. Luckily and thank God, each waiting period for me was 30 min or less, and only one lesion required another ‘stab’ at it, pun intended. By the time sutures were required, I had profound numbness in my lower lip, inside and out, my lower incisors, chin, and a bit of my neck. It was over in a little more than 3 hours. However, the suture line came as a shock: I am sewn from just under my lower lip, down my chin and just into the neck area, and not in a straight line. I couldn’t bring myself to glance at the open lesions prior to suturing: although I’ve seen ALOT in my profession, I couldn’t look at the 2 now-large circular cuts, down to the fatty layer. I did look at the newly installed sutures, because I was going to have to see it all anyway, 24 hours later, when I changed the dressing. It was still a shock, but I’m playing my medical/dental professional card and allowing the healing process to go forth. My biggest concern, following the usual (did they get it all? will it return? will it be found somewhere else?) is my younger son’s wedding this coming August, 6 months from now. Vanity, thy name is woman, and apart from wanting to be BCC-free, I am praying that this scar is invisible at best, or easily covered with makeup (which I never wear, except eyeliner) at worst, so that no one even notices. I’m still numb in 50% of the chin and lower lip, which is still swollen, can’t open wide enough to eat much or floss well (grrr…), laugh, smile, etc., but am assuming this will subside week to week. I’m also a massage therapist (my 2nd career), so I had to put clients off for a couple days. As long as I look up as much as possible during a session and avoid really strenuous style clients, I’m ok. This has been an ordeal, no doubt. I’m practicing patience as much as possible and following orders too. Thanks again to everyone for your stories and advice! Oh yeah—–I’m Scots-Irish, but wear sunscreen all the time; however, it was obviously not enough, so I’m switching to clear Zinc and/or Titanium oxide from now on. I wish I had seen this before my surgery, but I have to say, it looks like mine was a little easier or possibly smaller than yours. I found your narrative of the surgery interesting because I requested a sedative, and was given two pills and have no idea what they were or if I was told what they were. I actually have only one snapshot memory of the surgery. I kind of remember being shown the area before they stitched me up, and I remember the smell of cauterization. That’s it, and I don’t think it’s a bad thing to not remember the details as you do. I wasn’t prepared for the swelling. I assumed my lip area would swell, but the whole side of my face, clear into my eye socket, became swollen in spite of sitting up even during sleep. It was substantially down by a week. Anyway, your site is really great for those facing Mohs Surgery. Great job!! 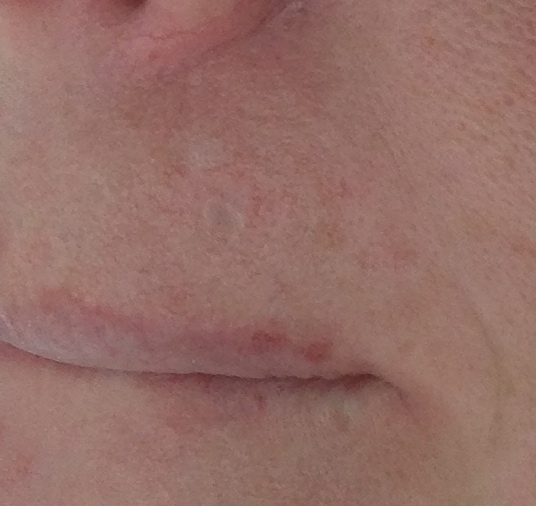 Update, roughly 4 months later– I’ve had a laser revision of the 3-inch scar, as it’s indented, pulls at my lower lip, is hideous and my lower lip is noticeably larger on the left. I am only happy that they got all the BCC. The 7 injections were NOT fun. And the laser was more like cautery: odorous. The scar looked ok for about a week, then not. I’m scheduled for a 2nd laser revision on May 30th. Told the nurse that either I get a light sedative or I’m arriving post-happy hour. Meantime, I’m massaging the dickens out of it, with Frankinscence, and it’s actually looking better. I hope I can avoid the revision in 2 weeks! Summer is here–Spring lasts about a day here in Missouri—and I’m sweating thru sunblock 24/7. But that’s the way it is from now on! I am four years post op. I had a large incision that went from under my nose, all the way under and into my mouth, along the cupid’s bow. I was so self conscious about the right side of my lip being so much smaller and numb. I would not smile as my smile was now crooked. I asked the plastic surgeon who did my surgery and he said he could do a cosmetic reduction to the left cupid’s bow but he advised to wait. Now, my lip looks 95% normal!! I can now wear lipstick, I smile just fine (I had to practice and work the muscles and tissue to loosen up). No ONE–NO ONE knows that I had surgery!! Although it sounds like a long time to wait, I feel fine–glad it is behind me and I am vigilant about those little sores that don’t heal. Keep your chin up!! This too shall pass. I enjoyed reading you pre and post op posting. I just had my lower lip, right side, MOHS’d and your descriptions were perfect. I’ve experienced the very same things, as I am now three hours removed from being stitched up…8-10 stitches I think. I’m a music teacher in a middle school so I am hoping I can be playing all woodwind and brass instruments in two months, when school begins. Thanks for sharing. Again, patience 😉. My chin waxes and wanes in this healing process, as does my lip (left side). 99% of the numbness has resolved except for the injection sites (8) from the 2nd revision, but I realize that my chin, the scar and the fallout in my lower lip won’t be normal for probably at least a year. I’ll have to masquerade it all for a wedding in August, but I’ve decided to be photographed only from the right haha. Following everyone else’s advice, I’d encourage both of you to tend to the scar daily, use silicone if your Doc agrees, and try not to stress unless something changes drastically in appearance or function. I know I’m late to the party but this is the only site that even remotely explains the Mohs experience. I had the surgery 2 weeks ago and was completely unprepared and not at all informed about what I was getting myself into. I had the upper lip (right next to my nose) done. Only one layer but about 25 stitches. All of my stitches are out (the Dr. took some out after 7 days, then the rest by my nose after 14). I still have a small hole next to my nose that I have to keep bandaged and I have to put ointment on 2x a day. My main question is when does the swelling go down on your lip and when will I be able to smile normally? The stitches didn’t go into my lip – they ended just a bit above. I can handle the numbness and even the hole in my face but I’m very upset about my smile. Any insight would be greatly appreciated. Thank you for this post. TILT, Yours sounds exactly where mine was. I HIGHLY recommend you see a plastic surgeon. My plastic surgery wasn’t covered by insurance, but it was worth every penny! I had a hole about half the size of a dime. I was horrified. But the plastic surgeon cut a little more and stitched it up. It’s been six months, and you literally can’t see it at all! It’s nearly perfect. If you really, really, really look, I lost just a bit of my Cupid’s bow. Yes, I can smile. The only residual effect I have is just a teeny bit of numbness. I don’t even think about it though. I wish I knew how to post pictures as I have a lot of them showing you how awful it used to look. The 2nd revision, 10 days ago, was worse than the 1st, due mostly to the injections (again), but also because it felts like the laser was set on “stun”, just short of “vaporize”. My chin was fire engine red and painful for two days. I’m using ScarAway, a silicone product, to further minimize the scar. Today it looks better, but is still tight and intermittently hurts. I’ll sum it up as “this is a process”. Lower lip still uneven as well. Patience! Hi Lisa–It is a “process” and I can only tell you from my perspective. I decided to NOT go with Moh’s surgery as I had researched the procedure and wanted to get it over in one surgery. I had mine done by a plastic surgeon, in a surgery center. Done in one visit! But with that in mind, the mouth/face does heal quickly!! There is numbness, and a tight feeling. I was very self conscious for quite some time. But, the best recommendation is to “exercise” the area. Push, pull, press on the scar. Try your best to move the area. Smiling is important, even if it is just in the mirror. Time will heal, and it does get better!! I’m so glad you were able to get it done in “one fell swoop” as it were! I was never given that option and God forbid another BCC pops up, I will investigate it. I was fortunate. My dermatologist suggested plastics from the beginning as she was concerned about where the lesion was located. But, finding a plastic to do the job–another story!! My daughter is a dentist–she referred me to oral surgeon friend. He too, said it was much too tricky for him due to location. I searched and searched the internet for someone who was a plastic surgeon who would handle. I also went to a Moh’s doctor and did not like that I would have her surgery, then have a hold in my lip. I finally found a guy, who has done some remarkable face/head reconstructions. He is in Denver, and I would highly recommend him. I know there was another person on this blog who also went out of state for her surgery. it was well worth it!! He is a plastic/oral surgeon and is/was wonderful!! Best yet, he worked with my insurance. He also helped me when I got skin cancer on my chest. So, if it ever pops back up, I have a go to guy for you!! Best to you!! Could you give the name of the surgeon in Denver? Absolutely!! His name is Mario Imola. He is double certified as an oral surgeon and a facial plastic surgeon. His office is terrific and they worked with my insurance. He has done two basal cell surgeries for me. First my lip and second on my chest. Let me know how it goes!! Always interested!! Best to you!! Hi Amanda.. hope you are doing great! I just wanted to thank you for posting your pics and giving the documentary of your thoughts on the procedure.. it helped me not to be so scared as I was waiting on my surgery ..almost same location as yours. I have had a small red spot on my right upper lip for like 3 years but it came and went and I had just asked my family md about it in March 2018 and she said “oh it’s probably a pimple or a cold sore, do you get cold sores? And I said no never had one ..” and she just left it at that . Then in July I went for a skin check and had the dermatologist biopsy it and yep it came back positive for bcc. So this is my 4th day since surgery and my lip is still pretty swollen but I’m hoping my scar will look as good as yours in time. Thanks again for sharing!